Dave and son Don McMurtrie sailing their Gwen 12 ‘Susan Too’ at Lake Fyans. Early models of Moth class, similar to my ‘Kontiki’ #199 ? Searching desperately for some more actual photos of the boats and clubhouse. It was in 1953, when I was 13, when my father Dave McMurtrie renewed his interest and activity in sailing by joining with our neighbour Reg Clarke and a couple of others in founding a local Yacht Club. 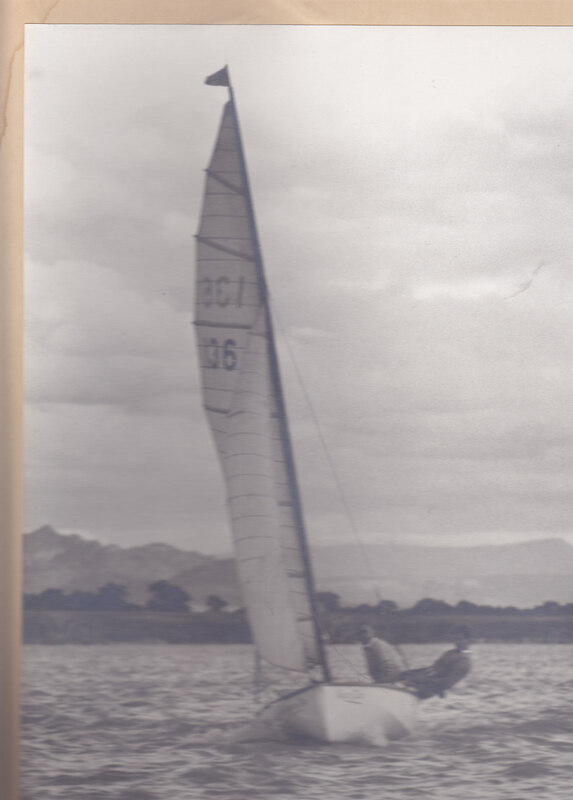 Previously, guessing at 1943 or 4, he had built a wooden yacht (Lulubelle), in our woolshed at Pomonal, and sailed it at Lake Fyans. His and one other yacht, I believe a Sharpie belonging to John Krievalt, probably were the first yachts ever on the lake. Maybe other lakes were considered but I recall an afternoon reconnoitre of Lake Fyans together with Reg Clarke and Malcolm Smith, when we checked all around the perimeter and finally selected the spot on which the Club House was built and still exists, thankfully! Reg Clarke was the first Commodore, Dad the Vice-Commodore and Race Captain and handicapper, and I think Malcolm Smith the Secretary. I am reasonably sure that Malcolm was an employee of Elder Smith. No idea of the dates of the Club registration and affiliation, or official opening. Or when the building was commenced or finished but I do clearly remember the process. Again, no idea who was responsible for the design, although I suspect that Dad had a considerable input, but it was all built by volunteer labour and without power tools. Even I, at that tender age, contributed by sawing wall studs to length and wetting the cement sheet cladding to lessen the chance of cracking in moving them into place. I have in my mind that my father actually financed the materials costs on a loan basis. Doug Palmer, another founding member involved in the clubhouse construction, provided transport of materials to the site in his GMC truck. A memorable incident for me was the dynamiting of a dead tree in order to widen the boating access to the club. (No conservation worries then). A fringe benefit was a few fish floating to the surface. Dad and Reg Clarke carried that out with me “assisting”. Laurie Trevan and I were the first junior members and maybe the only junior sailors, certainly in those days. We had a strong but friendly rivalry. Other than the FJ VJ that Dad raced (with me crewing), the other yachts were all Moth class, as I remember. After a couple of seasons Dad bought a Moth (Hornet Too), for me so I became a solo sailor. Dad moved on to a Gwen 12 while I was still involved, and later to catamarans for a bit more speed and, I guess, control/balance. I was often nervous when the wind strengthened and but learned to right the boat if and when I tipped over. 🙂 It was a fast yacht and on one strong wind race day, with Charlie Chibnall crewing (a rare occurrence), to provide the needed extra ballast weight, we set, and held for a long time, the course record. A wonderful experience for a teenager in all respects, sporting and social. I have many exceptional memories indelibly imprinted in my memory and am deeply indebted to many other members and their families. Other significant families were those of Doug Palmer, Charlie Chibnall, Cyril Smith, Fred and Ella Ridge, and many associated friends. I sailed and spent all Christmas holidays camped at/near the site until I moved to Melbourne to board for tertiary schooling, (1956). Still spending the holidays at the Lake until a working life in Melbourne curtailed serious contact with the Club. Along the way, water skiing became an interest to some club members, Reg Clarke being a strong advocate, even though himself a keen yachtsman. This became a strong part of the Club, with Reg building a ski jump adding to the facility. A special viewing device mounted on the clubhouse verandah railing enabled jump distances to be measured. Also on that verandah, a great spot for partying in the evening, sat the starting gun. A very miniature but real canon firing blank shot gun cartridges. A highlight being allowed to “pull the string”. 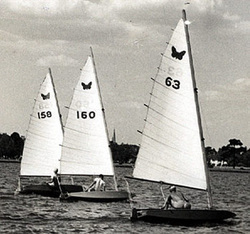 The influence of the power boats tended to be a conflicting interest for the yachtsmen and for some time past my direct contact with the Club, sailing, or some sailors began sailing at other venues, including Green Lake, near Horsham. It is extremely pleasing to me to see that the Club still continues to provide great sporting and social facilities and that sailing is enjoyed by locals. I enjoyed reliving these memories at both earlier anniversaries, and the 60th is really something special.